I know that most of you probably hit the Black Friday sales like I did, searching for the perfect gifts for all your friends. I have always loved getting my friends presents because I love the process of picking out something perfect or unique to them. I also love wrapping the presents as well (which is one of my favorite parts of the Christmas season!). 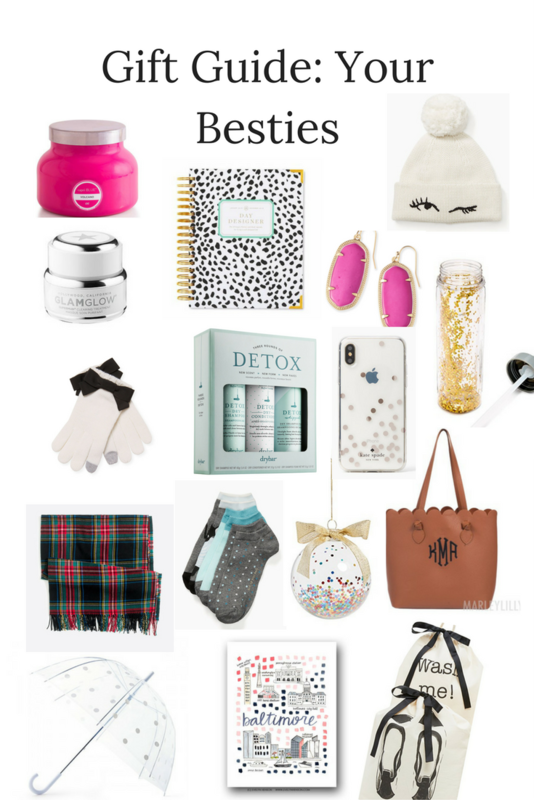 While every bestie is different, I wanted to include a general bestie gift guide, as these are things I know that I, as well as my friends, would love. I've even added a few of these items to my personal wishlist. Happy shopping! volcano candle- ok so I know this is very basic, but almost every friend of mine is obsessed with the volcano candle, and isn't it even cuter in pink?? facemask- any college student knows the necessity of facemasks. I think that any skincare item makes the perfect gift because it is something that can be used again and again and something a girl loves. You could even make a gift basket with several spa items! beanie- super cute and needed for chilly winter days, need i say more? sock set- everyone loves socks, especially in sets! These are a classic cute pair perfect to add to any gift! ornament- i've always loved the idea of giving friends ornaments so they will think of you when it's on their tree! this would be perfect for any girl about to move into her first apartment or house! travel bag set- last but not least, i think this gift set is perfect for the traveling girl. I personally love this brand of travel bags and got a couple over the summer. I had a volcano candle on my holiday wishlist. Daily Designer's are seriously the best planners ever. I use the school year version, so I'm not due for a new one yet.